One of the many reasons I write this blog is to help you keep the Internet free and open. Throughout human history, whenever a government or other powerful entity has wanted to subjugate a people or group, the first thing they do is isolate that group from others and control the flow of information to it. By enabling all of you in Null Byte land, you have the power to keep the Internet free, open, and uncensored while making the world a safer place for everyone. One of the areas that governments and large corporations have been aggressively trying to limit is torrenting sites. As you probably already know, torrenting allows individuals anywhere in the world to share files without the need for a central server. Torrenting sites do not host the files, but simply serve as a "directories" for the connections to those files. In recent years, the U.S. government, at the behest of several large media companies, has been aggressively trying to shut down these torrent directories. Megaupload was probably the most famous, but Demonoid, Pirate Bay, and others have been forced to shut down or relocate beyond the reach of law enforcement. Megaupload was taken down in January 2012 and its founder arrested. One year later, it was relaunched as MEGA and the legal case against its founder is floundering. In addition, large media companies have employed "hired guns" to sniff out torrent traffic, identify the IP addresses of the uploaders, and attempt to pressure their ISPs to cut off their Internet access or pressure law enforcement to file charges against them. Although there may be some illegal activity taking place on these torrent sites, they also can be an excellent method of sharing files between individuals anywhere on planet earth. They can also be a method of sharing uncensored information when an authoritative regime is trying to limit communication. Two Dutch researchers at Delft University have developed an anonymous way to share files without the need for torrenting directory sites like Megaupload and Pirate Bay. Building upon a Tor-like technology, they have built an application that combines both the functionality of the torrent directory sites with torrent applications like BitTorrent or uTorrent. It is called Tribler. Developed for Windows, Mac OS X, and Linux, you can download it here. Tribler adds three layers of proxies between you and the seeder. This insures that if one proxy is compromised, of limited anonymity or placed there by an industry or government agency, the other two will still hide your traffic. 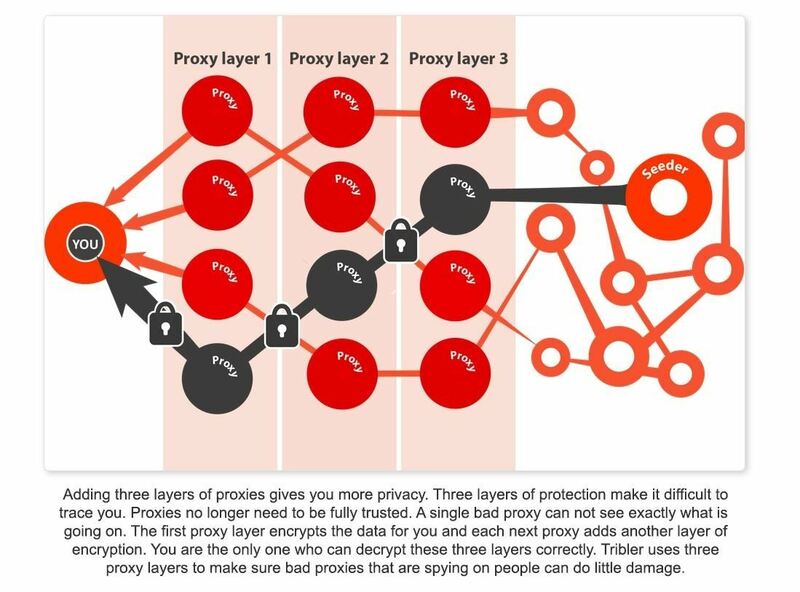 The first proxy encrypts your traffic and each additional layer adds an additional level of encryption that only you can decrypt. As you can see in the screenshot below, I have downloaded and installed it on Windows 7 machine. Unlike BitTorrent and other torrenting applications, there is no need to download and install torrent files from a torrent directory. Tribler enables you to search and torrent in one application. Furthermore, Tribler allows you to stream the files to your computer that you find via the "Search" function at the top of the screen. You no longer have to wait for the whole file to download in order to watch it. Notice below that when I hover my mouse over the file, two orange buttons pop up, "Stream" and "Download." If I click on Stream, I can begin watching immediately, no need to wait. You can test the anonymity of Tribler by clicking on the "Downloads" tab on the left pane and Tribler will begin an automatic test of your anonymity showing you the proxy IDs and hops between you and the seeder of the file. This new app, Tribler, offers you the anonymity to share files across the Internet without interference by government spy agencies and corporate hired guns. Enjoy, my nascent hackers, as we continue to keep the Internet free, open, and uncensored! Nice piece of software. First time I heard about Trible, so thanks for sharing. However, wasn't megaupload a One-Click-Hoster, rather than a torrent site? Good point, but it had multiple functionality. It's been a long time since we started to learn everything from you and thank you for everything. You have taught us alot so can you please teach us how to hack instagram. Obviously, I don't mean many followers and ect... How it's possible to hack another instagram account to find it's username and password. I cant help feel a little insecure about Tribler. may i say. why insecure? have you had viruses? 1.the node can see exactly what you are downloading. 2.every node encrypts the data, only you can read it. above sentences are confusing me. If i use this will comcast still send me copyright strikes?